Presented by Michelle Schultz, MD and Joanne Schleicher, MSSW, LCSW, ACHP-SW, Mercy Clinic Palliative Care. This presentation covered the differences between Hospice and Palliative Care, how to introduce and explain Hospice and Palliative Care to patients, families and other health care providers, the benefit and use of the Interdisciplinary Team in Palliative Care, and how to promote education about Palliative Care in the community. Click here for the PowerPoint. Presented by Allison Jordan, MD, HMDC. This presentation provided an understanding of the prevalence and presentation of psychiatric disorders at end-of-life, an appreciation of how personality traits can exert an influence on patient care, and pharmacologic and non-pharmacologic treatments for psychological distress at end-of-life. Click here for the PowerPoint. Presented by Eileen Spinner, MA, LPC. This presentation covered understanding the theoretical and empirical foundations of Dignity Therapy and life review, describing tools and instruments that can be used when implementing Dignity Therapy and life review, and identifying how Dignity Therapy and life review can be applied to a diverse range of patients and care partners. Click here for the PowerPoint. Click here for the Handouts. Click here for a Related Article. Presented by Harold Braswell. This presentation provided a detailed introduction to the ethics of U.S. end-of-life care. It began with a discussion of one of the central controversies in end-of-life ethics: medical aid in dying or the “right to die.” It then argued that we should move “beyond” the right to die to consider the ethical implications of U.S. hospice care more broadly. By moving beyond the right to die, we can have a fuller understanding of end-of-life ethics, and a richer toolkit to promote social justice for dying people. Click here for the handout. Presented by Cara L. Wallace, April Trees, Jennifer and Leslie Hinyard. Participants were updated on literature about barriers in advance care planning (ACP) and end-of-life care and information for how clinician’s own personal experiences of loss, death, and personal ACP may be connected to professional practices. Click here for the PowerPoint. Susie Pekios, LCSW, MSW, MA and Julianne Fels, RN, CHPN, ANP At the presented ways Advance Care Planning can aid in the dying process, identified signs of normal, expected physical changes that happen months, weeks, days and hours before someone takes their last breath and talked about ways dying people shift away from this earth in an emotional and spiritual sense. They identified some of the “Needs of the Dying” and explored evidence of “Nearing Death Awareness” – What it is and what it means. 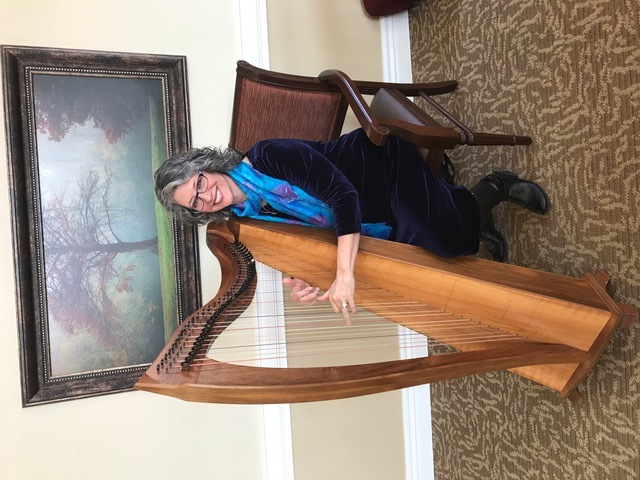 Amy Camie, Spiritual Harpist demonstrated how sympathetic resonance, forced resonance, and entrainment influence our thoughts, feelings, relationships, and communication. 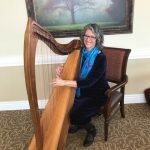 The presentation provided a deeper understanding of the power of music and the importance of making conscious self-care choices that support providers and those around them. Using The Conversation Starter Kit, Gateway End-of-Life board members, Joan Bretthauer and Kim Gladstone guided participants through steps for having a discussion about end-of-life wishes. Oct 6 Weber Road Branch, Oct 13 Grant’s View, Nov 1 Bridgeton Trails Branch, Nov 16 Prairie Commons Branch, Jan 11 Florissant Valley Branch. Dr. Patrick White, Chief Medical Officer, BJC Hospice identified commonly used medications that lack scientific evidence to support routine use in care for patients with life-limiting illnesses, the toxicity from a commonly used supplement that may harm quality of life in patients with life-limiting illnesses and one strategy for reducing unnecessary medications in patients with advanced illness. Presented by Dr. Thanh-Mai Vo, St Louis University, Department of Internal Medicine, Division of Nephrology. This event covered the incidence and prevalence of End Stage Renal Disease (ESRD), the typical prognosis of the patient with ESRD, the perspective of patients living with ESRD, the role of shared decision making in ESRD and how to manage the patient with ESRD who decides to forego dialysis. For the PowerPoint click here. Presented by Reverend Deborah Burch, Chaplain Bob Eigenrauch, Imam Orhan Kaya, Rabbi Dale Schreiber, with Dr. Gary Behrman, Moderator. This diverse panel helped attendees increase their knowledge of a variety of religious beliefs and practices regarding advance care planning and end-of-life issues, develop inclusive attitudes about how diverse religious perspectives inform practice at end-of-life, acquire skills and obtain resources on how to support persons and partners-in-care, in ways that incorporate and respect diverse faith traditions. For handouts, click here. Presented by Jill Oberle, MD, Becky Lasater, MSW, LCSW, OSW-C, Nicole Landwehr, MSW, LMSW, Kara Moreno, BSW candidate, Laurie Chappell, RN, MS. In this experiential workshop, attendees learned of the role of provider self-awareness in relation to advance care planning, the potential benefits of expressive arts to patients, providers, and the community in relation to advance care planning, the experience of participating in an expressive arts activity. Presented by Candice Ellis and Nan Downing, State of Missouri Department of Health & Senior Services. At this event, attendees gained knowledge and understanding of elder abuse at end of life through an overview of current statistics, and Adult Protective Services and how Missouri responds to hotlines including interventions. Click here for the PowerPoint. Presented by Steve Sewell. Recognize the nature of conflict, explore effective collaboration, Identify components of healthy relationships and techniques for reframing conflicts. Click here for the Power Point. Tuesday, July 19, 2016, Workshop – Good Grief! Can’t You Just Get Over It? Presented by Beth Barrett, MSW, LCSW, CT & Kelly Karavousanos, LPC, CT. Participants gained an understanding of the essentials of grief as a continuum from diagnosis through after death, three dimensions of grief and best practices for supporting family and friends during grieving moments. Click here for the PowerPoints. This workshop presented an opportunity for participants to self-examine their strengths amidst the many changing demands that occur when serving those at the end of life. The model described moving from caregiving to partners in care as a means to build resilience. Click here for the PowerPoint slide presentation. Presented by Rachelle Barina. Attendees learned to understand the importance and scope of ethics for their institution/organization and for themselves as a person, to understand theoretical explanations that may underlie moral institutions and differences of opinion and to deepen their moral imagination and improve their capacity to respond to ethical conflicts. Click here for the PowerPoint slide presentation. Panelists: John Baue Devaney, Karen Shine, Desirae Roseneau, Sharon Randall Gardner, Dan Loesche. Attendees explored options available after death: burial, body donation, cremation, etc., services provided by each option, specifics of the programs offered that cater to their clients and considerations for the choices they have to make before death (pros and cons of each type of service). Presented By: Heather Bell, MSW, LCSW, ACHP-SW. Participants gained knowledge and understanding of reasons why it’s important to discuss end-of-life goals and wishes early, several tools to help with the Caring Conversations about EOL wishes and ways to ensure one’s EOL wishes are honored. Presented by Elizabeth Wilde, MSW, LCSW and Jason Winfrey RN, BSN, CHPN. Attendees expanded their worldview regarding the importance of applying diverse spiritual approaches at the end-of-life, identified spiritual themes that appear at end-of-life, and applied approaches to empower patients to move from suffering to transformation. Presented by Charli Prather, MSW LCSW RYT CCTP. Participants gained knowledge and understanding of the unique needs of Veterans, practical interventions for engaging their patient, ways to minimize patient and family stress, and yoga and meditation techniques for Veterans and those experiencing trauma and grief. This conference brought together three perspectives on critical issues in end-of-life care. Our presenters shared their extensive experience in cultivating the skills and sensitivities in listening to persons at end-of-life; and presented challenges and opportunities for health care professionals to develop creative and effective approaches to serving persons and their families at end-of-life. Click here for PowerPoint slide presentation. Presented by J. Paul Newell, MD & Susan Andresen, Ed.D. Through an open conversation, we explored ways in which advance care planning and directives can support the wishes of the dying and their families and lift some of the burden from their health care professionals; and how to create timely, structured, and helpful conversations with patients and their families about end-of-life care. Click here for the slide presentation. Thursday, August 7, 2014 – Desire for Hastened Death: Critical Evaluation and Management in Palliative Care Patients. Presented by Mark F. Heiland, Ph.D & Anupam Agarwal, M.D., MSHA. Desire for hastened death is a wish for death to occur prior to natural death. It is expressed in the context of progressive disease, a response to symptoms of physical and psychological suffering. Typically it does not involve active suicidal ideation or request for assisted suicide. This presentation outlined critical recommendations to assist providers in identifying patients with a desire for hastened death. Identifying and managing approaches to these palliative care patients is challenging. Barriers to assess DHD and risk factors to both provider and patients were discussed. Click here for the slide presentation. Presented By: Tiffany Webster, CSM, LCSW, Judy Mange, PT, MBA, CMC & Maria Madeleine Kolbet Air Force Veteran, MSW. Attendees gained knowledge of the history and evolution of the Gateway Alliance for Compassionate Care at End of Life and the efforts to advocate for end-of-life issues in St. Louis area, the history and evolution of hospice care in St. Louis and lessons learned in developing the first free-standing hospice in the area, various hospice models and their impact on service in St. Louis, the Medicare Hospice benefit and how it has helped to expand services, the forecasted reimbursement plan by Medicare and the effect it will have on hospice, efforts to preserve and protect the Medicare Hospice Benefit. Click here for PowerPoint slide presentation. This presentation examined the obstacles to effective end-of-life care that are inherent within the Western medical model, starting with the early years of medical education. The basic components of Integral Theory were presented as a rationale for understanding and overcoming the limitations of Western medicine. Click here for PowerPoint slide presentation.